After three 24-hour days of driving South from Moscow through numerous checkpoints, we finally arrived in the town of Sochi. In the summer, this area on the Black Sea with the Caucus mountain range as a backdrop is the Russian Riviera. Sadly, we werent here in the summer but mid January. The whole drive had been in thick snow with an air temperature of 20ºC/4ºF, and we still had a long way to go to reach our goal. This was the beginning of my first trip to Russia. 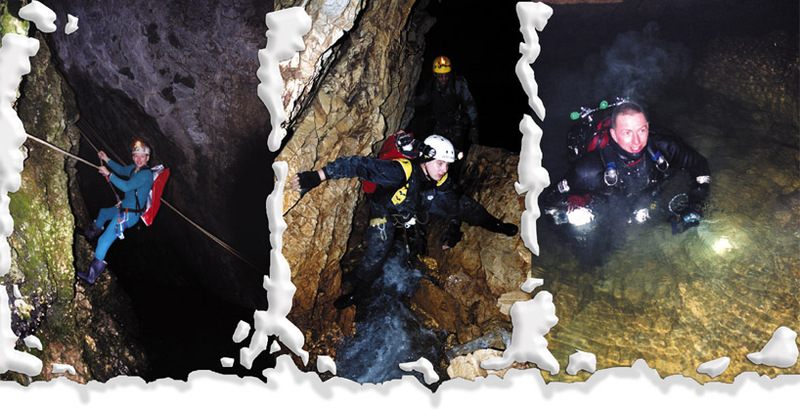 After completing a full cave certification for three Russian students in the Dordogne region of France, they invited me to Russia to dive a cave they had visited before that went beyond 50m/164ft, and they wanted me to help them continue exploration. 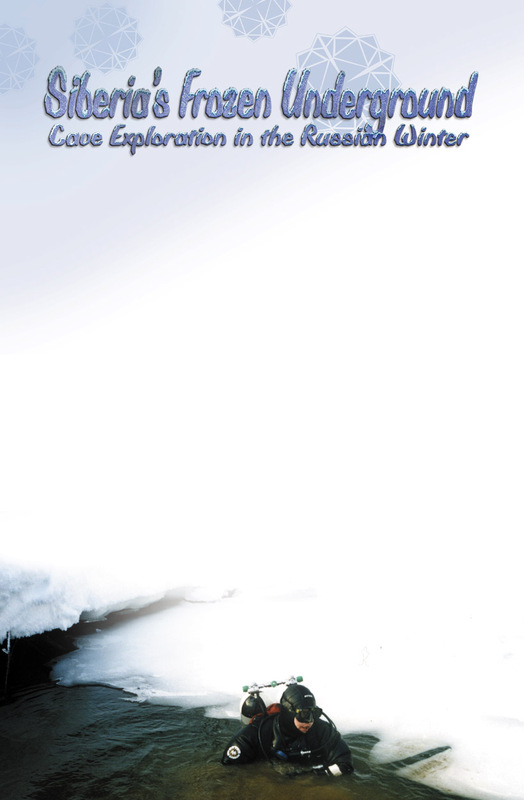 This trip lead to three further trips between 2001 and 2004 in both the Caucus mountains in Southern Russia and the Ural mountains in central Russia. The fourth day was spent driving, digging, towing, and pushing three 4X4s full of equipment to our base in the Caucus foothills through increasing amounts of snow. Our base was an abandoned government building about 10K/6.2 miles from advanced base camp, which was the cave entrance. The only way to get the gear there was by foot in rucksacks and frames. This was achieved mainly due to the hard work of a team of 20 cavers who were our support team for the next two weeks and involved carrying 25 cylinders, a generator, a compressor, and many bags of cave diving and camping equipment. They hiked the gear through the forest, into a gorge, and then up the gorge to the cave entrance. Several sections of the journey required rope hand lines, abseils or wire ladders, and the main drop into the gorge required a rope and pulley haul system to lower the gear diagonally down into the gorge and across a river. This was certainly the most remote cave I had yet to dive, and I was very exited to see the sump and do a recognisance dive to see the existing line that the Russian divers had laid. By many standards, the trip to the sump was straightforward. We could walk to the sump with only two short crawls and one ten foot climb with a hand line while wearing twin tanks or a rucksack of gear so it did not take long to get to the sump pool. The cave is an active resurgence for several deep SRT caves high in the mountains above, and the reason we were here midwinter was to get low water flow in the cave as the sinks on the mountain were all frozen solid. The last 100m/328ft to the sump followed an active stream with the entire flow, which was low and made visibility good. Alexi Rechetniak and I were diving separately on the first dive. Visibility swimming into the flow was around 10m/33ft and at 4ºC/39ºF was not as cold as I expected. The passage was clean white limestone with a heavy gravel floor. The light from my HID light reflected from the walls lighting the 4m/15ft diameter descending tube. The passage covered 100m/328ft and slowly dropped to 10m/33ft following a corkscrew of sweeping turns in the passage. It then descended rapidly in several steps to a ledge at 30m/100ft then dropped vertically to a flake at 40m/133ft where the line ended. I tied in my primary real and dropped down the shaft to reach a dark black gravel floor at 50m/164ft, where the passage continued down at a 35-degree angle and up to 8m/25ft wide but only a 2m/7ft high. 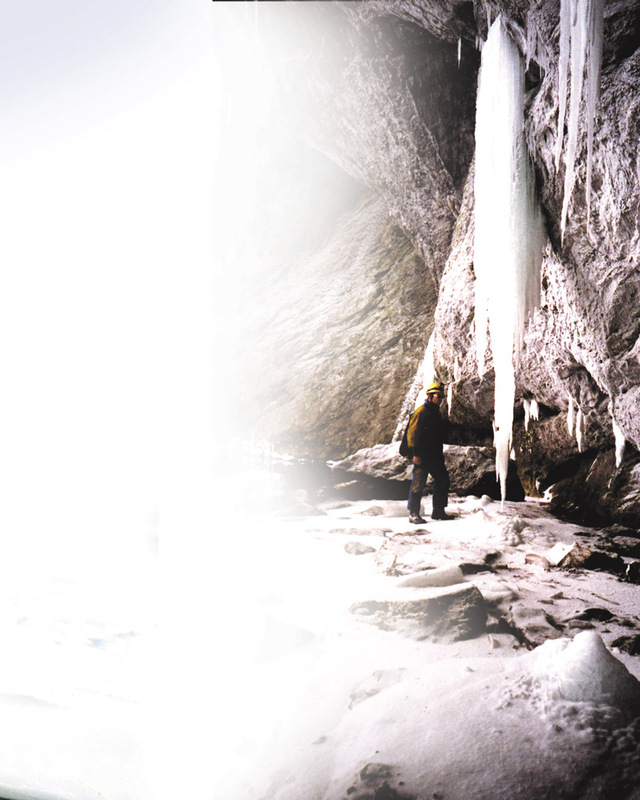 The height of the cave dropped further to a single meter. I moved forward slowly laying my line tight to the right wall using orange rock flakes on the ceiling as belays. This was the recognisance dive, so I had elected to use double 12 L/72 ft3 cylinders of air and a 10 L/66 ft3 cylinder of EAN80% for decompression. When I reached 65m/213ft at a large flake of rock, I tied off the line leaving the reel for the next dive and began my return swim. The decompression was calculated by my VR3 set to air and EAN80% and excluding deep stops throughout the return swim required 22 minutes of decompression. We sat around the campfire talking through the dive and the 60m/196ft of new line added to the sump. We also began to plan for the next dive while drinking copious quantities of hot tea, which was kept in a huge pot over the open fire all day and was the ideal way to warm up after the dive. The next day was spent mixing gas from the cylinders of helium and oxygen we had carried up the gorge and topping off with air from the 3 CFM compressor. I mixed trimix 16%O2/40%He for my double 15 L/98 ft3 cylinders, a 10 L/66 ft3 stage of EAN50% and two 10 L/66 ft3 stages of EAN80% for the dive. Again, the decompression on my VR3 set to 16%O2/40%He, EAN50%, and EAN80% was to be followed, but we cut a backup table in case of computer failure or gas failures. In the morning, the previous days sunshine and a rise in the air temperature had caused snowmelt on the mountain and the water level had risen 8m/26ft. This meant that the sump was now 100m/323ft longer and my limit of 65m/213ft yesterday would now be at 73m/240ft. Flow had increased but still easily diveable, so we carried the gear to the sump for a dive. To deal with the cold, I used Fourth element as a base layer, a fleece one piece mid layer, then a 400 gram high grade thinsulate under an Otter technical skin, a 3mm hood with an 8mm hood over the top and 3mm neoprene gloves under 8mm two-finger mittens for my hands. This paid off on this dive, as the melt water had lowered the water temperature to 3ºC/37ºF. through the low 1m/3ft high section of passage to a descending 4m/14ft wide by 3m/10ft high gravel floored passage. I continued to a point 70m/230ft from my previous limit where at 86m/258ft I belayed the line at the start of a steeply descending passage that continued deeper to the limit of visibility and turned my dive due to reaching the MOD of my mix. Excluding deep stops, the dive generated a chilly 72 minutes of decompression with gas switches to EAN50% at 22m/70ft and EAN80% at 9m/30ft. One year later at two in the morning, Alex arrived at the cave entrance again to find vast quantities of dirty brown water flowing out of the entrance and through the previous years advanced base camp. The pleasantly warmer conditions meant we would not be continuing exploration of Hosta this year, but the next day we drove further south to Alexs plan B site, a cave called Glbokiy Yar. This was to be more like the caving Im used to in the UK, sections of vertical cave, climbs and abseils, sections of stream passage and dry cave, and multiple sumps. It took four days of rigging, hauling, and carrying to get the gear to sump 1. We then did a recognisance dive. Sump I can be followed in rapidly descending passage to a depth of 30m/100ft where the entire water flow issues from a low, wide slot only 15cm/6 inches high just beyond the elbow of the sump. Looking into this slot, the passage can be seen to ascend and enlarge to the limit of visibility. Further back at 14m/45ft, a sideline leaves the main water flow and passes through boulders to surface in a small muddy pool at the base of an ascending vertical rift. This continuation leads up via 30m/100ft of easy free climbing to a 50m/164ft hands and knees crawl and a large boulder floored chamber. From the chamber, a very unstable 45-degree boulder slope must be descended using a rope and descender to a small and very uninviting pool of brown water, which is sump 2. This turned out to be quite an intimidating dive as after descent in zero visibility the passage narrows like entering a funnel and becomes so tight that I had to remove stages and unfasten my waist belt to allow myself to pass this short section with cylinders scrapping the ceiling and belly and chest scrapping the floor. On passing this restriction, the passage continues in poor visibility and small dimensions until reaching an opening that drops into a crystal clear large dimension passage in the main water flow. Downstream, this passage reaches the other side of the 15cm/6 inch high slot seen at the end of sump 1. Upstream, it continues for 300m/1000ft to surface in a large lake leading directly into sump 3, which is 200m/650ft long and surfaces in stream passage where you have to crawl out of the water through thick mud for 50m/164ft before dropping back into the stream. The stream follows for 100m/325ft to sump 4, the objective of our trip. It took us three dives to reach this point due to spring melt floods. Each year the lines in sumps 2 and 3 are been broken in many places and have to be repaired. Eventually, with two support divers with us at sump 2, Alex and I were able to reach sump 4 with all the cylinders needed for me to reach the end of Peters line in sump 4 at 50m/164ft and hopefully go on. We had planed the dive the previous day, and I had elected to carry double 15L/98ft3 cylinders of trimix 15%O2/50%He, a single 12L/72ft3 stage of EAN32% and two 7L/45ft3 stages of 100% O2. Suit inflation was again to be from my travel mix stage and decompression was to follow my VR3 computer set to 15%O2/50%He, EAN32%, and 100% O2 and backup being a second VR3 set the same. After entering sump 4, the passage descended rapidly in a series of steps and shafts to 47m/154ft where the line ended at the lip of another shaft. I tied on my reel and continued to descend into a large passage full of large car size slabs and breakdown ending in a large rock splitting the passage. Passing the rock at a depth of 60m/196ft lead to a gravel floored continuation of the descending passage. After laying 70m/230ft of line, the passage levelled out and reached a restriction at 72m/237ft of depth where I turned my dive on thirds. Excluding deep stops, I did 37 minutes of deco before surfacing in the canal to rejoin Alex for the trip out through sumps 3, 2, and 1. Alex had decided that having been to Russia twice now that the next trip the following February would be somewhere cold! So after another four-day drive, I found myself loading dive gear onto a sledge for a 12-hour journey up the frozen and snow covered White River to the base camp for our next dive site. This time we had driven East to the Ural mountain range that separates Europe and Asia. Air temperature varied between 20ºC/4ºF and 40ºC/-40ºF and when we finally arrived, the resurgence sump we were to dive had a water temperature of 2ºC/35ºF. Following Alex up the frozen river through the wilderness with blue sky and sunshine and no wind was a truly fantastic experience. The cold was nowhere near as bad as expected, but I found that the two weeks we were there I had to consume a large amount of calories and fluids to stay warm. The cave was known as Shoulgan Tash. The dive site was a well-known and well-studied cave that despite its remote location was gated due to ancient prehistoric paintings found deep in the dry sections of the cave. I was fortunate and privileged to be able to see the paintings of Mammoth, Bear, Horse, and abstract in the cave during my visit but our aim was to dive the resurgence sump outside the cave. 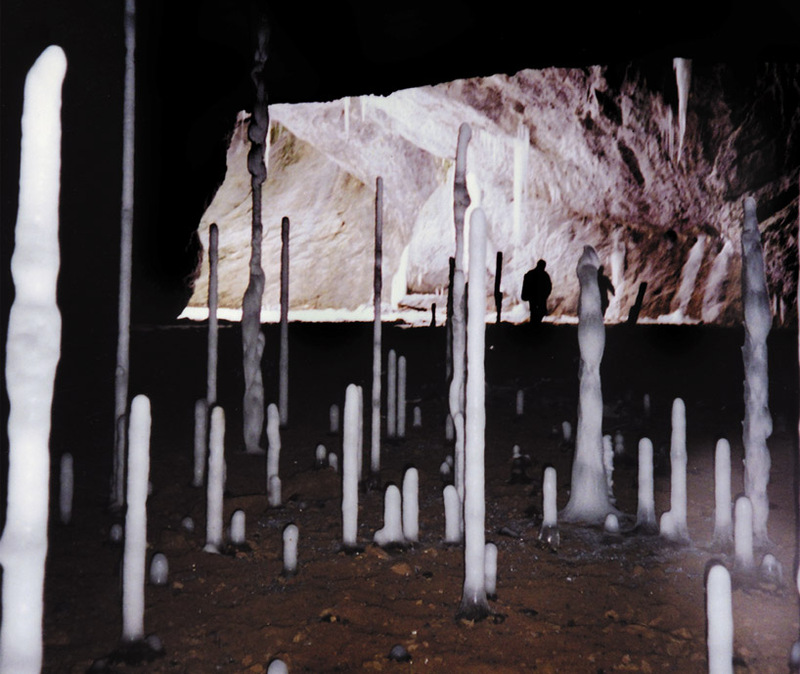 A small part of the resurgence was free of ice, but the cave mouth was full of ice Stalactites and stalagmites and the view out was stunning. We did a series of set up dives over the first few days to check the condition of the line already laid in the cave by Alex to a depth of 50m/164ft. We then got ready for a push dive by planning the deco and mixing the gas. Again, deco was to be calculated using two VR3s set to trimix 15%O2/50%He double 15L/98ft3 cylinders, two 12L/72ft3 stages of EAN32%, two 10L/66ft3 stages of 100% oxygen and a 2L/13ft3 argon suit inflation cylinder. Alex dived first and placed the two oxygen cylinders at six meters and one of the EAN32% cylinders at 35m/115ft on the line. I then entered and breathed the second EAN32% cylinder to 35m/115ft where I switched to my bottom mix and continued to the end of the line at 50m/164ft. I tied on a new line and continued following a steeply descending passage over a gravel floor passing a restriction at 70m/230ft then another at 77m/252ft, which was only passed by entering feet first and pushing the gravel floor down the slope to make a big enough gap to squeeze through. I then entered a little gravel floored room at 81m/266ft where the line was tied to a 2kg/4.5lbs lead block and pushed into the gravel in the left corner of the room where the flow came out of a small slot too small to enter. I turned to exit to find that the restriction I had kicked through had slumped closed behind me. I had to pull the gravel around the line towards me in arm fulls to dig my way through the restriction, which reduced the visibility to zero. After passing the collapsed restriction, I got back into clearer water and began my return swim, which required 60 minutes of deco excluding deep stops. Ive had the opportunity of visiting many other sites in both the Ural and Caucus regions all of which have huge potential. We are currently planning our 2005 trip. All three trips have only been possible due to the hard work of Alexi Rechetniak and all the support divers and cavers.